SYNOPSIS: Our band of bold adventurers has just blown through the 18th level of the world's most fearsome dungeon, so what do they do for an encore? Since the city of Orario doesn't have a theme park, the next choice for Bell, Hestia, Lilly and the gang would seem to be a trip to the hot springs… and, conveniently enough, a battle with some hellhounds has led them to an undiscovered underground oasis! However, there's something fishy about these springs, beyond the fact that Hermes happens to have bathing suits for all the ladies in their correct sizes! Will the secret be discovered before it's too late? Will Hestia finally come clean with Bell? It'll all come out in the wash when our heroes learn the answer to: IS IT WRONG TO EXPECT A HOT SPRING IN A DUNGEON?!! SYNOPSIS: When Hiro Hiyorimi tries to save a beautiful young woman from certain death, he ends up a dead hero himself! However, since the drop-dead girl is Princess Hime, daughter of the King of the Monsters, his "reward" is to come back as a not-quite-living soldier in her honor guard of horror! That means helping fight off the army of supernatural monstrosities Hime's siblings are unleashing against her in hopes of moving up the ladder of succession. And if facing off with vampires and zombies isn't bad enough, how can anyone be prepared for the truly weird ones like were-sharks, pandas and killer dumplings? This sure isn't the afterlife Hiro was hoping for, but the really sad part is that Hime is the good girl in all of this. Or at least, as close to good as you can come when you're on the wrong side of the gates of Hell! Get ready for the wildest animation about reanimation ever in PRINCESS RESURRECTION - The Complete Collection! SYNOPSIS: A Single Moment Can Mean the Difference Between Hope and Despair...It’s 6:59 forever...The members of the Yukawa family have inherited the Stasis Spell, the power to stop time. When they use their power, they enter Stasis, a world where everything has stopped. One day, Juri’s nephew and brother get kidnapped. Trying to rescue them, their grandfather uses the Stasis Spell, but they are suddenly attacked by others who are also able to move in Stasis. It’s not a race against time, it’s a race outside of time and the dangers are increasing with every non-second in KOKKOKU! SYNOPSIS: It's an insidious invention, originally created to control animals. Now it's the ultimate rush for a dark cult of jaded thrill seekers. Place one SCM in your mouth and your opponent does the same. Then play a game… any game… and the winner literally takes control of the loser, binding them to their will and turning them into a personal plaything until the winner decides to set them free - if they ever chose to free them at all. And as the use of SCMs snakes its way through the undercurrents of society, with increasing numbers of unfortunate players bound into submission as drones and harems, the even more terrifying discovery of SCMs that can take over anyone, at any time, threatens to enthrall the rest of the population in DOREIKU - THE ANIMATION! SYNOPSIS: Using amazing weapons powered by super-science, the international terrorist organization known as GALACTOR is out to steal all of Earth's resources for itself and its inhuman masters. Mankind's only hope? The International Science Organization and their elite strike force, the Science Ninja Team! But these five young heroes will have their work cut out for them as they take on the seemingly impossible task of defeating GALACTOR's horrific arsenal of mechanized weapons of mass destruction and endless armies of henchmen. Can costumed commandos Ken the Eagle, Joe the Condor, Jun the Swallow, Jinpei the Sparrow and Ryu the Owl really overcome such overwhelming odds? Utilizing the incredible technology and fighting techniques created by Dr. Nambu, and with the mighty ship the God Phoenix at their command, they just might! 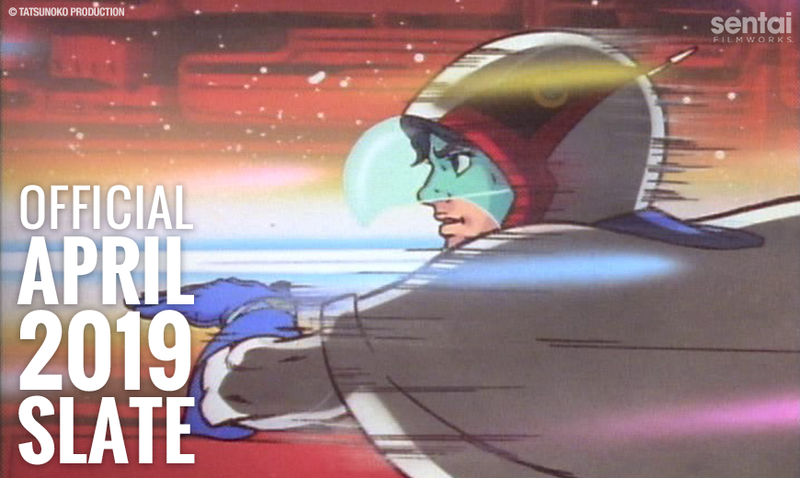 It's time for the bad guys to get old-schooled science-ninja style as Japan's original super team defeat evil, one flying kick at a time, in the legendary, one and only GATCHAMAN!